One of the first things I’ve noticed as we cut back on meat is that the grocery bill has taken a nice drop. Chicken and beef aren’t that expensive and I usually stocked up during sales and shopped for the best deal. When you compare cheaper meat to a vegan lifestyle, there’s apparently a pretty big difference. Even The Kid was shocked yesterday at the store when they totaled up things. LOL, and she doesn’t even pay the bill! The next thing you notice is the lack of protein so I had to get creative. I could resort to the old standby of vegan protein powders, but I’m one of “those” that likes to chew my food. 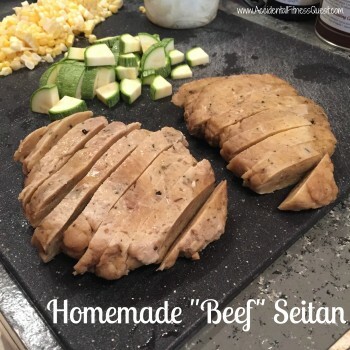 The first week I used tofu a lot which is in my comfort zone, then I decided to branch out to seitan which is a wheat based meat substitute. Ha, wheat meat! They use seitan in one of my favorite curry burritos so I knew the texture and really liked it. Then I looked into the price of buying it already made and was kinda shocked at the price. A quick google turned up recipes that didn’t seem too complicated. You can even get creative and make different flavors of wheat meat – beef, chicken, pork, and… uhhhh seafood. I’m not convinced I’m trying that last one just yet. This week I made beef seitan and used it in sandwiches, on salads, in tacos, and just ate the strips plain. Not bad at all, and it was really easy to make. Plus you batch cook it so I got 8 servings from one trial run! Measure all of the dry ingredients into a bowl and toss to combine. Add the wet ingredients and stir with a spoon or fork to mix. The mixture will start to ball up and get hard to stir. At this point, begin kneading it with your hands to finish mixing. Knead into a smooth ball by hand for about 5 minutes. Let the ball sit and rest for 5 minutes while you prepare a steamer. Bring a large pot of water to a boil under a metal steamer basket. Once the dough has rested for 5 minutes, cut the dough into half. Flatten each half in to a cutlet shape that’s about 1/2 – 3/4 inch thick. Wrap each half in foil and place in the steamer over the boiling water. Cover and steam for 15 minutes, flip the packets, and steam for another 15. Remove from the steamer and let cool. You can use it right away or refrigerate it for up to 4 days and use it later. It also freezes well. Makes 8 servings at approximately 122 calories – 21g protein, 5g carbs, and 2g fat. The ingredients are relatively easy to find at your local Whole Foods, Amazon, or even at Walmart Neighborhood Market. I already had chick pea flour and nutritional yeast on hand since I’ve used those before in dairy-free cooking and baking due to The Kid’s allergy. The only thing I had to buy for the recipe was the vital wheat gluten.